Speculation is rife of a high risk of a recession for the UK economy during 2008. However the last analysis in this current series for 2008 on UK GDP growth concluded with the opinion that despite early year weakness the UK economy will avoid a recession, this coupled with falling interest rates will be supportive of the UK stock market during 2008. But firstly how did the FTSE 100 forecast for 2007 fare ? Creating 12 month forward forecasts on traded markets are invariably difficult as unlike economic statistics which exhibit either monthly or quarterly changes, the stock markets involve some 250 data points of sentiment and trend building. The only way to handle this is to break down the trends into a series of impulse and corrective waves to carry the market in a particular direction into the year end. This trend is subject to certain assumptions, which last were that a. The FTSE would have another strong up year on the back of continuing healthy economic growth, and b. That the FTSE 100 would only revisit the 6000 level once during the year. However as the FTSE chart clearly indicates that the FTSE corrected to the 6000 level, not once, not twice, but three times (A,B,C), and that with the third drop late in the year. It is hard enough to project the current impulse or corrective swing, never mind to extrapolate forward some 7 swings into year end. But as one of the two assumptions failed, this hit the FTSE 100 index which at the time of writing is at 6470. However the analysis of 16th of December and 12th of November did anticipate an strong impulse swing higher in the year end to target a close for 6640. This is nearly 300 points less then the 6900 originally anticipated based on only one correction to 6000 during March 07. Having completed the analysis on the UK housing market, interest rates, inflation and GDP growth, I have a clearer picture for the FTSE during 2008. However this now entails having to try and attempt to extrapolate the probable impulse and corrective trends towards a single price point of 31st Dec 08. 1. The first assumption on the basis of recent analysis being made is that the FTSE 100 index will be weaker during the first half of the year then the second half of the year. 2. The second assumption is that as the second quarter draws to an end and subsequent economic statistics are revealed to be less pessimistic, the market will view these as bullish then originally anticipated and therefore suggest a change in sentiment towards the upside sometime during June and July 08. 3. The third assumption being made is that the government and the Bank of England will over do monetary easing and feed the stock market with excess liquidity, as well as capital that would have gone into the housing market flowing into the stock market therefore any declines in the first half should find support in the 6000 to 6100 region. 4. The fourth assumption is that the FTSE bull market is still intact and destined to continue. the market is not over valued on forward earnings of 12X or so. 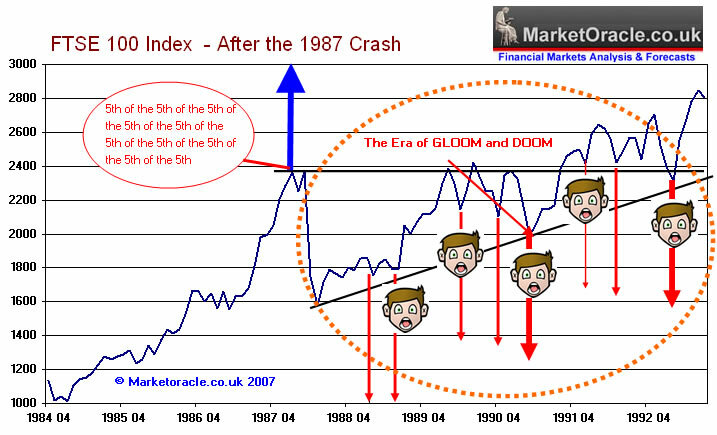 The FTSE is still recovering from the 2000 to 2003 bear market, and I expect the accumulated fear of that bear market to sustain the stock market for many more years as illustrated below. The Bull market following the 1987 Crash was a scary time to buy against a constant bearish barrage of news and statistics. The Bull market following the 2000 to 2003 bear market was / IS ? a scary time to buy against a constant bearish barrage of news and statistics. The below chart illustrates the various extrapolated trend scenarios with a concluding end of year price point for the FTSE 100 Index. Yes, I do expect the FTSE 100 Index to have a volatile year, however I expect dips towards and below 6000 to be met by buying and thereby support weakness early year. Unlike the forecast for 2007, I have penciled in a low for mid year, the effect of this is to prevent me from becoming overly bullish in the trend extrapolation into year end. Therefore the forecast is for the FTSE 100 Index to end 2008 at 6947 or higher. Which on the last close would represent a healthy gain of 7% amidst an atmosphere of increasing pessimism going into 2008. As always, remember that all forecasts are just best guesses, you have to consider the number of primary assumptions and swing trend expectations involved which for 2008 number 9. 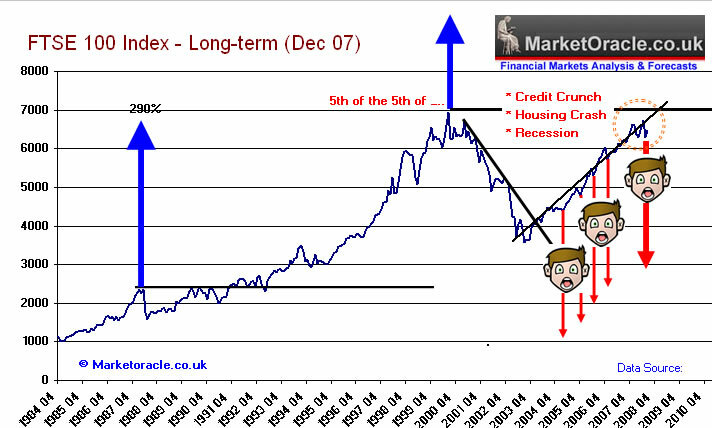 What if the FTSE falls by the end of 2008 ? Well, my expression will resemble that of the face on the earlier charts ! Though probably this year I am under-estimating the strength in the FTSE 100 index and it actually manages to break above 7000 towards the end of 2008. Yours financially committed to his forecast analyst saying - All the best for the new year and stay tuned for the balance of forecasts during the next few days.